Order within 8 hours 11 minutes for Same Day Delivery! 6 gorgeous roses. Other colors are available. Pick first choice....if not available, red will be delivered. Ceramic Urn With Liner, Wet Floral Foam, Foliage: Variegated Pittosporum, Ivy, Coral Roses, Peach Roses. Unconventional yet elegant, surprising that special someone with this eye-catching display is a great way to say "I think you are beautiful!" 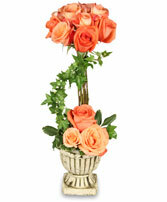 A beautiful sphere of coral and peach roses topiary bouquet stands tall in a ceramic container (may be different than what is shown) with more coral and peach roses and greenery serving as the base. As a simple yet exquisite touch, an ivy vine cascades down from the sphere into the base. Can specify 1st and 2nd choice of color. 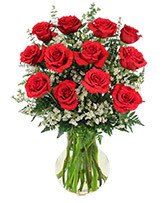 Let someone know that you appreciate their exquisite tastes by sending them this bounty of colorful roses. Pink not available! 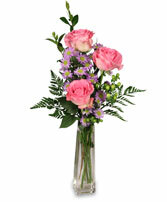 They say three's a charm and this bud vase is proof! 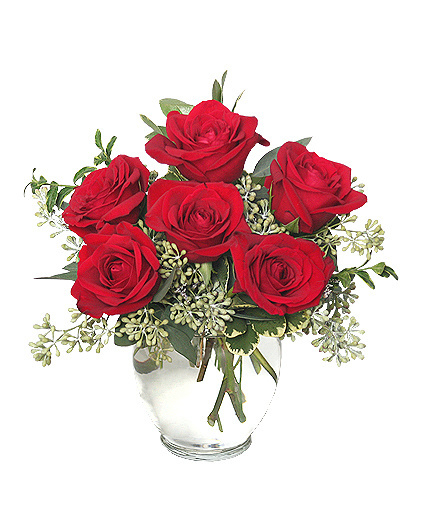 Three delicate roses are a great way to show your appreciation and gratitude. Call today to order! Please select 1st and 2nd choice rose color.